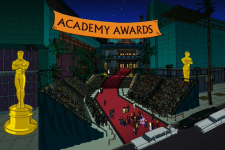 For other uses, see Academy (disambiguation). Announced by Billy Crystal's head. 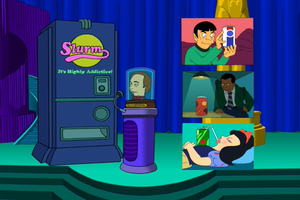 The soda machine Robot announcing the nominees for Best Soft-Drink Product Placement. Announced by the soda machine Robot. 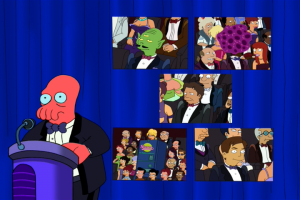 Dr. Zoidberg announcing the nominees for Best Actor. Billy Crystal's head on the Oscar statuette. Dr. Zoidberg and Bender in the backstage. With Calculon instead of "the fifth guy". Harold Zoid and Dr. Zoidberg. They took place 1000 years after the 74th Academy Awards. Joan Rivers' head: Hi, I'm Joan Rivers' head. I tell you, I've had so many face-lifts, they finally lifted it right off my body! It's true, it's true! Billy Crystal's head: Now I know how a Pez dispenser feels. [The audience laughs. Jack Nicholson bangs his chest.] Oh, you like that one, Jack? Dr. Zoidberg: And, instead of the fifth guy, Calculon, for his powerhouse performance in The Magnificent Three. Man #1: Uh-oh. He read the wrong name. Man #2: [whispering] Shh, just play along, like they did for Marisa Tomei. This page was last edited on 15 September 2013, at 18:57.